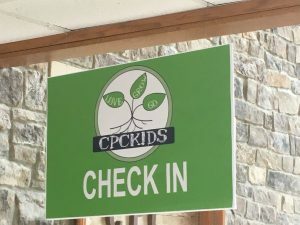 We can’t wait to greet you at our CPCKids Check In Station! If you are a first time visitor, once you enter our lobby, head straight to our Check In. If you would like to save time on the day of your first visit, our first time visitor child registration form can be printed and filled out prior to arriving. Once checked in, Sprouts can held to the nursery, all other ages are encouraged to stay with their families to worship together for the first 15 minutes of the service. After our opening worship, PreK-5th graders are dismissed to their classrooms. Preschool – 5th graders participate in an offering in their classrooms. If you have any questions or concerns, please contact Jill Rumple, Children’s Ministry Director.